Simply put this is a witty outlook on modern life and the consumerists of today. It does bare great similarities with the classic Orwell novel but where that can be quite dark and bleak this novel, although fatalistic somewhat is rather funny. The characters in the novel all having surnames from their employers is a particularly amusing idea. 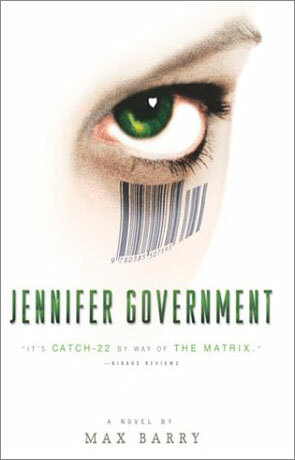 So you have characters such as John Nike, Hayley McDonalds and of course Jennifer Government. The world the book is set in is definitely in the not too distant future where the world has basically been split into two factions, one led by the USA and then the rest of the world. The USA countries including England, Australia, New Zealand etc. all have governments with limited powers, the ability to chase and prosecute criminals is affected by the budgets set on them by the victims own ability to pay for their services, meanwhile companies such as Nike and McDonalds are the real powers and their quest to be the largest and the best and the only company people use drives them to get rid of the competition and steer their profits upwards. John Nike marketing executive has a plan to boost sales of some Nike Mercury’s which cost next to nothing to make and retail at several thousand. He approaches Hack Nike, a lowly merchandising officer whose only reason for being approached was that he was in the wrong place at the wrong time. He is contracted to kill fourteen teenagers who buy the trainers and therefore raise their coolness and therefore demand from people who want the trainers that are worth killing for, and therefore what started out as a simple marketing ploy suddenly becomes very messy and a tangled affair. Hack doesn’t have it in him to do the killings and goes to the Police to tell them about the deal. The Police, like all companies in this new USA have their own guidelines, budgets and agendas and they inform Hack he is unable to get out of the contract as it is legally binding and that he will have to do the shootings for which he will be convicted for, unless he subcontracts the job to them. Hack agrees. What follows is an endless pursuit to find the people who committed the murders by the government, people on the run from corporations for breaking contracts, companies fighting each other, rebels disillusioned by the whole capitalism idea and one little girl who simply wants to spend time with her mum and buy a dog. Great stuff. Written on 19th September 2014 by Arron.